Citing a source familiar with the matter, Nikkei reports Apple and Qualcomm were working toward a settlement for weeks, during which time Apple began evaluations of Qualcomm's 5G modem for use in iPhone. In addition to what appears to be internal testings, the tech giant also requested partner manufacturers to test the chip, the report said. Despite the effort, Apple will not be able to build the chipmaker's 5G silicon into this year's iPhone. The deadline for integration, both in terms of hardware and software, has likely long passed. 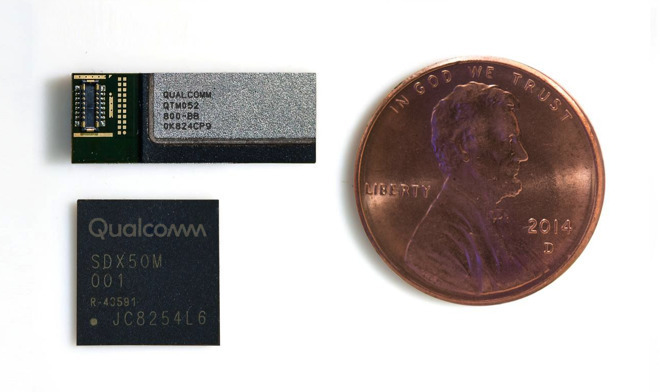 "It is too late for Apple to use Qualcomm's chips this year, but for 2020 it will purchase modem chips, including 5G modem chips, from the chipmaker for iPhones after finalizing the deal," according to an unnamed source. With a settlement secured, Apple is now free to use Qualcomm's 5G technology. Previously, Apple's two-year legal battle with the chipmaker restricted its options to Intel, whose XMM 8160 5G modem is rumored to be hamstrung by delays. A report earlier in April claimed Apple had "lost confidence" in Intel's ability to deliver the chip on time, as the company missed several development deadlines. "Apple had been a little concerned whether a sole supplier for modems could affect the company's plan to introduce its first 5G smartphone next year," one source told Nikkei. Apple's search for a viable 5G modem supplier has been well documented over the past few months, with numerous reports noting the tech giant is in dire straits without Qualcomm's participation. The situation changed earlier today, when settlement negotiations were finalized in time to end Apple's original action over withheld rebates and chip licensing fees that just got underway in San Diego. While specific settlement terms have not been disclosed, the deal includes a multiyear chipset supply agreement and a backdated six-year license agreement with a two-year option to extend. Apple paid a sum to Qualcomm as part of the contract, though the company could regain those funds in rebates if the agreement is structured after Qualcomm's typical contract terms. How long Apple will rely on Qualcomm hardware remains unknown. The iPhone maker is in the process of developing its own 5G chips for use in future iPhone models. Reports suggest Apple has between 1,200 and 2,000 engineers on the project, including recruits from Intel and Qualcomm, who are working toward a solution predicted to debut as soon as 2021.